Zen Cart is a free software available for download from the Zen Cart website. It is an open source ecommerce solution that has been around for awhile now. It has improved over the years in many departments. The security has been greatly enhanced in the later versions and some changes have also been made to the payment options provided. 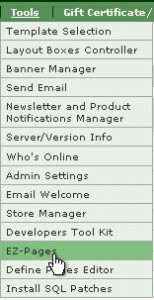 The admin section has got some changes too. Almost every Zen Cart built has a unique design or layout. Such layouts are either custom made by web designers or are purchased from the many online template sites. There are e-commerce web developers that can be hired to actually install the new template. In the case that the template has been designed by a web designer the template will actually need to be manually integrated by a Zen Cart developer. It is necessary to take care while integrating the code so that the original Zen Cart remains intact thus keeping the basic functionality of the Zen Cart working. Choose Zen Cart EZ-Pages ModuleZen Cart contains many modules from payment, to shipping to even CMS module where custom pages with textual content can be added. Zen Cart also posses a feature where the new content added via the inbuilt CMS module is automatically added as a menu item in the header and the footer as per requirement. This requires you to have not modified both the header and the footer files while integrating the template as mentioned earlier. Select Zen Cart EZ-PagesThe CMS module is present in the Admin section and is accessible from the Admin Menu Tools –> EZ-Pages. It is possible to add new textual content from this menu. The important factor to keep in mind while saving your new textual content is assigning a sort order in the appropriate box. For example if you require the content to appear as a menu tab in the header then goto the header box enable it and then add the sort number as per the position where you wish it to appear. The same applies if you wish for the content to appear in the footer as well. I cannot stress enough that simply enabling the button under the header section will not work. This is often the error made by rookies. It is essential to place a number in the sort order box and the menu item will be displayed as per sort order. In addition to displaying textual content in the menu tab it is also possible to set up and EZ-Page to load a third party website, as well set up an internal link. For example I can set up a page that loads the website https://www.zencart.com. It can also set up EZ-Pages to load an internal link that loads the inbuilt contact page. 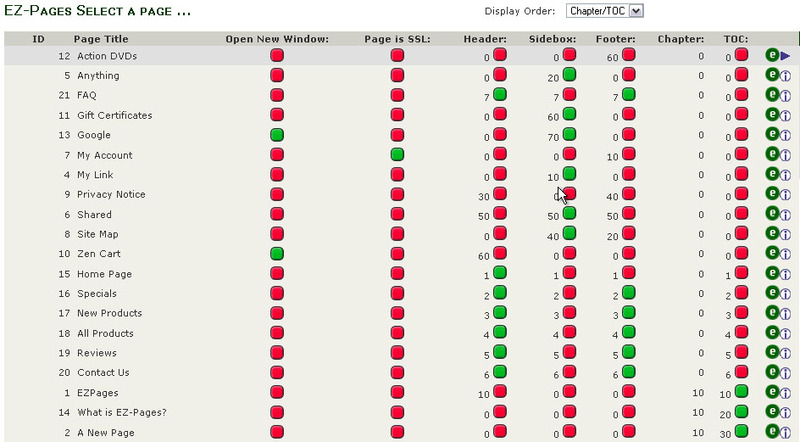 Each of these pages can be set up as menu items as well. Alakmalak is one company that is into Zen Cart development since a very long time and is capable of providing help and support to get your shop online. How to manage EZ-pages and add them to menu? How to Create and Use Widget in Magento?